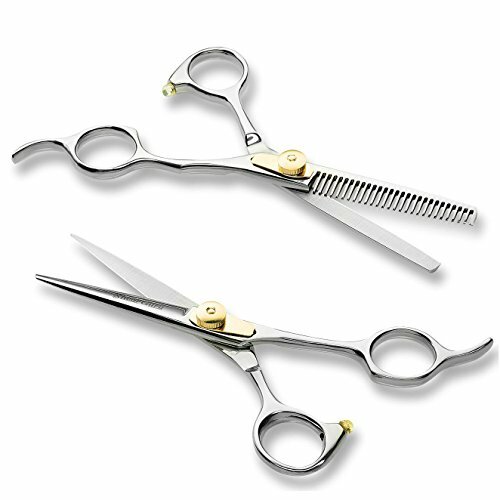 Professional hair cutting scissors are shears used in a salon or barber setting. Usually, they are sharper, more ergonomic, and comfortable than scissors you would use in a home setting. However, there is also a significant range of salon scissors from which to choose. Thinning, razor and regular shears are the most common, and you can find several of these options below. However, before you go crazy and buy the first pair you see, understand that not every pair is the same. Some are quality; some are not. Some are affordable, and some are expensive. Then, the features vary dramatically. You can find the material differs from one pair to the next, with Japanese stainless steel on one pair then regular steel on the next. By the time you get to thinking about the blade and scissor length, you’re confused, addled, and ready to throw in the towel. It’s true – buying professional hair cutting scissors is a confusing process, which is why we have put this buying guide together. You can choose from any of these nine options below – all with options for different people. Some are more suitable for home hairdressers, while others are high-end – ideal for salon workers who need to work quickly and effectively. There are even pairs amongst the mix that will only cost you around $10, but others closer to $250. It’s a real mixed bag in the world of professional hair cutting scissors, so take your time when you go shopping. The more time you spend researching, the higher the chances of getting scissors you will love. If you need a quality pair of professional hair cutting scissors to keep as a spare, then you may find this set fits the bill nicely. While they don’t quite hit the mark to take over as your new favorite, they will offer everything you need to create the perfect cut on your next client. They have a 2.25-inch blade set within a 5.25-inch pair of scissors. Instead of stainless-steel construction, they also feature Cobalt Molybdenum. 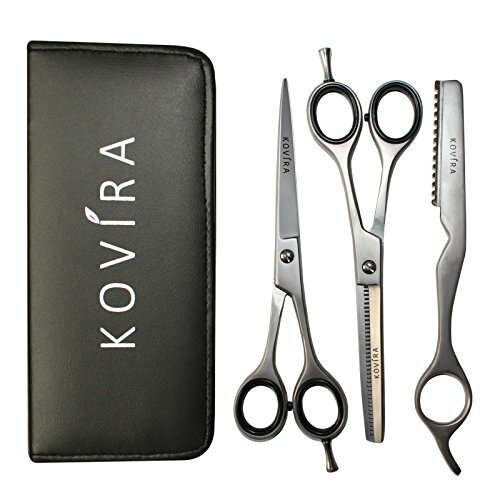 This unique choice of material helps to keep the professional hair cutting scissors as sharp as possible for longer. But, that’s not all you will enjoy about these scissors. The are hand-honed, feature a detachable finger rest, and even have a rubber finger insert. Therefore, you get more grip, control, and comfort, than you would with other scissors on the market. They are also lightweight at only 1.4 ounces and are made right here in the USA. They may not win any awards for being standout professional hair cutting scissors, but you won’t frown upon having to use them. When you are on a budget, it can be a challenge to do your job when you need to buy professional hair cutting scissors. Fortunately, these scissors are not only affordable so more people can afford to buy them, but they are ideal for getting the job done. You are bound to love styling with the use of these professional hair cutting scissors. They feature Japanese stainless steel, fine adjustment screws, and precise, hand-sharpened blades within a 6.5-inch pair of scissors. They also come with an ergonomic grip handle which helps you to remain comfortable and in control when you cut hair. While these handles are on the small size – more suitable for small-handed stylists, that still doesn’t mean they aren’t going to be comfortable. Many people believe these are more suitable for home use given the rounded tips and prevalence for creating split ends, but if you are in a bind and need affordable professional hair cutting scissors fast, these are well worth your consideration. If you need entry-level professional hair cutting scissors that won’t break the bank, you may like to consider adding this pair from ULG to your shopping basket. While many people don’t believe you would use these as a professional stylist, they are more than suitable if you’re learning, styling from home, or even giving your dog’s fur a quick trim! Unfortunately, their durability leaves them unsuitable for much else. However, there is still a lot to love about these professional hair cutting scissors, even if they don’t meet the mark for everyone. They feature premium quality Japanese stainless steel, are 6.5 inches to be more comfortable to hold and have a 2.5-inch cutting blade as well. 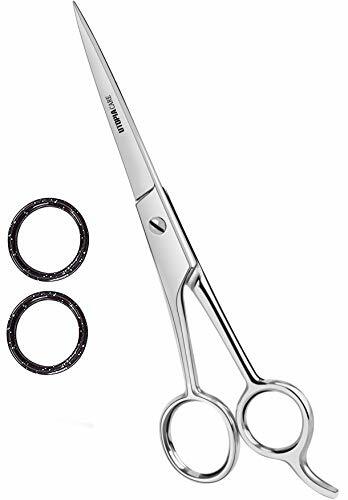 These professional hair cutting scissors also have a beautiful mirror polish finish with blue diamond stones, while being ideal for right-handed stylists. The grip is offset for comfort, and the finger ring is even detachable. As you can see, there are many convenient features to sway your decision in either direction. For the price tag, you do get a lot of bang for your buck with these professional hair cutting scissors. If you’re tired of ending up with low-quality professional hair cutting scissors, then it might be time to check out these shears from KINSARO. At the middle of the road point regarding price, you can rest assured they’re going to be higher quality than a less expensive pair, but could potentially be as easy to use as more costly pairs as well. Besides the price, you will enjoy other features of these professional hair cutting scissors. They are six inches long, feature 440C Japanese curved blades, and have a honed, sharpened edge. They also have a comfortable handle you won’t mind using for extended periods, coupled with a lightweight structure at only 1.9 ounces. Then, when you go to purchase these professional hair cutting scissors, you benefit from being able to choose one of four patterns. Each of these is high-quality, built to last, and will accentuate your hair styling experience. If you’re trying to find a new pair of salon shears to put a smile on your face, these just might. 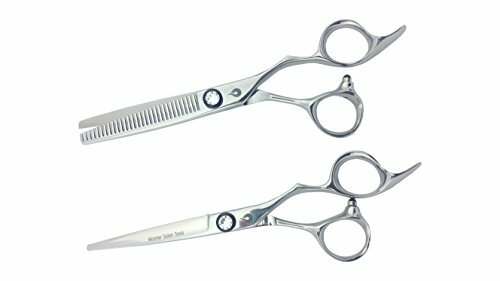 If you need a quality pair of professional hair cutting scissors that will be suitable as your spare pair, then set your sights on these barber shears from Suvorna. While there are some issues with their suitability for professional use, you may find they are more than suitable if you are a barber or trim hair from home. They come with a lifetime warranty for any faults, hollow Japanese 420 steel ground blades, and even a blue titanium tension adjustment and finger rest. The resultant professional hair cutting scissors are striking in design and practical for everyday use. They also have a hardness level of 53-54, stay sharp for quite a long time – even if they’re not as sharp as more expensive scissors, and are relatively affordable on the market. They won’t win any awards for leading the market, but you will find these professional hair cutting scissors are winners in their own right. 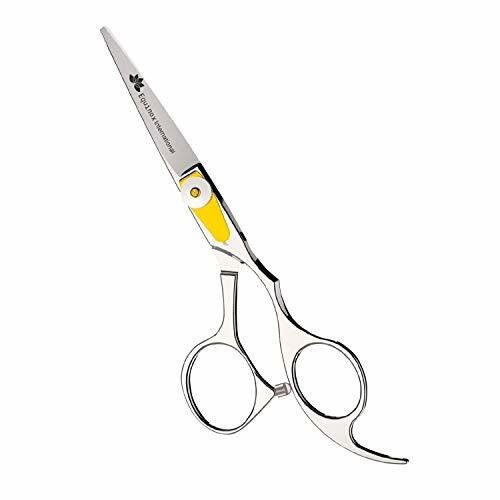 Aside from a few wobbles, there’s every reason to believe these professional hair cutting scissors from Smith Chu will fit in well with all your other salon accessories. Of course, their price tag shows they are not going to be the best of the best, but given the number of features on offer, they may suit all your needs quite nicely. They are six inches long to be akin to other brands on the market, and also feature Japanese stainless steel as well. This steel stays sharper and is more durable than different types for sale. You can also buy these professional hair cutting scissors as part of a set or on their own. There are two sets to choose from – both of which will look lovely in your home or business, or even as a gift. Then, sealing the deal is the addition of the crown emblem. It adds a point of difference that can be an icebreaker for clients. If you need premium stainless-steel professional hair cutting scissors, give these a go. Professional hair cutting scissors, unfortunately, don’t last forever, so if you need new ones that will tick all the boxes for professional and home use, these could be it. Instead of getting one pair from SDL, you get two, as well as a cute carry bag and a comb. 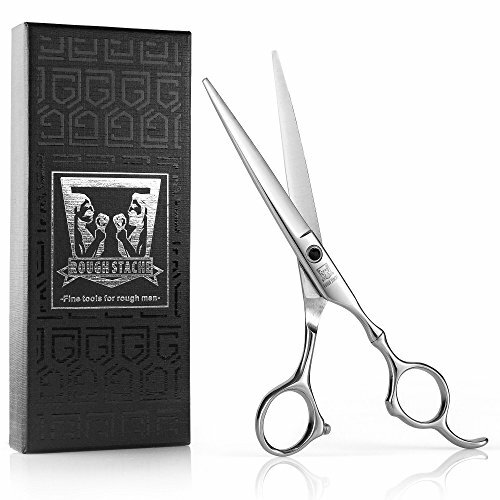 The scissors consist of thinning and barber scissors, both of which feature premium quality 440C stainless steel. Because of its quality, you will have no problems using these scissors at home, at the salon, and even with children. They come in two sizes, feature a comfortable ergonomic handle, and are of a generous size to suit more people. What’s more, the scissors and comb all fit nicely together in the very portable bag you get to carry with you. Finally, the design of these professional hair cutting scissors is what will win you over. Instead of looking cheap, even though they are affordable to buy, these scissors look like they are worth a fortune. They’re heavy-duty yet comfortable to use and will impress with each cut. Don’t look past SDL when you need professional hair cutting scissors for your business. 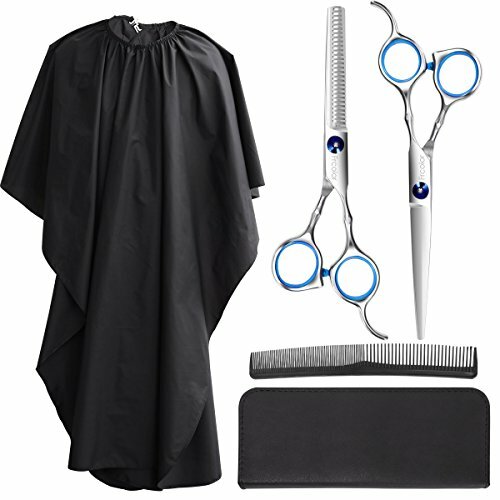 Most people know that when it comes to buying professional hair cutting scissors, you need to spend more to get more. While you may not like the idea of putting all your hard-earned money into scissors, the pay off can be significant when you enjoy the quality of your tools when you’re cutting hair. These Harutake professional hair cutting scissors will impress time and time again, even if you have to pay a bit more for the privilege. One of the most standout features is the tension screw. Most people find that on low quality professional hair cutting scissors, the tension screw works its way loose, before sometimes removing itself altogether! On this pair, that doesn’t happen. Instead, the screw is hidden out of sight, with you being able to access it only when you need to, not by accident. The construction is also another noteworthy point. As they are made by hand, the manufacturers have put a lot of thought into the detail. They also have 440C Japanese stainless steel, a patented knob key, and bent-down thumb rings for unparalleled comfort. Sealing the deal is the generous five and five-and-a-half-inch measurements to suit more people in a professional setting. When the time comes to upgrade your salon scissors, don’t be afraid to invest a little more. You will be pleased you did. People with small hands can struggle to find professional hair cutting scissors that cater to their needs. 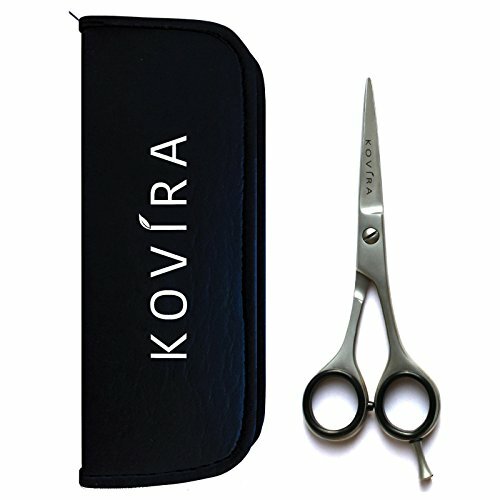 Fortunately, when you buy hairdressing scissors from Kovira, your little fingers will fit snugly. With the removable rubber handle inserts and the short handle area itself, you can feel comfortable and secure while cutting hair. It’s almost like they were made for people with smaller-than-average hands. What’s more, these 5.5-inch scissors feature premium stainless-steel material that both looks and feels fantastic. By using such metals, users can benefit from sharp scissors that last longer before you need to sharpen them. However, the real benefits are yet to come. When you purchase these professional hair cutting scissors, you get two pairs of scissors as opposed to one. Both the thinning and texturing shears are available for an affordable price, all within a zip-up cushioned leather case. 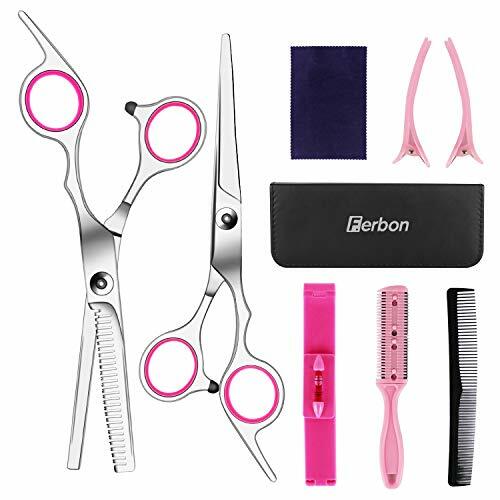 The sleek design, affordable price tag, and relative quality of these scissors make them well worth closer inspection if you need a new pair of professional hair cutting scissors for salon or home use. Purchasing professional hair cutting scissors can be a frustrating undertaking. As a salon worker, you will be pulling long hours, trying to make time to upgrade and buy new gear. Then, when it finally arrives, it’s often not what you wanted, expected, or needed. Instead, you were deceived by an online shopping manufacturer. Unfortunately, that’s quite often the case with buying professional hair cutting scissors online. You need to be able to look deeper than the picture, working out what features you require, what you can live without, and what you can expect to pay for a quality pair. Take note of these five points to help your online shopping trip go that much smoother. The best type of steel for professional hair cutting scissors is stainless. It stays sharper longer and doesn’t stain or rust. However, there are also other options such as Cobalt Molybdenum which is similar to stainless steel but tends to stay sharper for longer. Not all blades are the same on salon scissors. Consider what you are using your scissors for. Some manufacturers call their scissors professional but proceed to sell them with rounded tips. Be on the lookout for blades that don’t quite look professional. The label might say they are, but that’s not necessarily the case. What’s more, read reviews about blade sharpness. Does it stay sharp a long time? Or, do you have to keep sharpening them yourself? If you are a hairdresser, you’re on your feet all day with your fingers clinging to a scissor handle. If that handle is not comfortable, you’re in for a whole world of hurt throughout the day. Don’t end up with disappointing scissors with horrible handles. Pay attention to what the manufacturer says. Quite often, you can buy unique ergonomic handles with thumb rings and replaceable components for better comfort levels. If you have larger or smaller hands, it’s not silly to ask whether these are suitable for one or the other. Then check to see whether they are left or right-handed. The tension is a significant cause for concern for many salon workers. If it’s too tight, the professional hair cutting scissors can be challenging to use – with hair not even cutting in some cases. If they are too loose, the scissors can move around offering no confidence to the user. Most professional hair cutting scissors have tension knobs, but where they make all the difference. Try to find a pair with a hidden knob you can’t touch by accident. How long is a piece of string? The cost for professional hair cutting scissors differs dramatically. It can also be hard to know whether you’re being overcharged or getting a good deal. If anything, you need to do your research on manufacturers and brands. Find out what your salon uses and trusts and try to find scissors in that range. You may only pay a small amount of money for a pair online, but what happens if they don’t meet the mark? Do your research to avoid disappointment. Why Nail Care and Nail Health is Important for All Women? How to Do it?